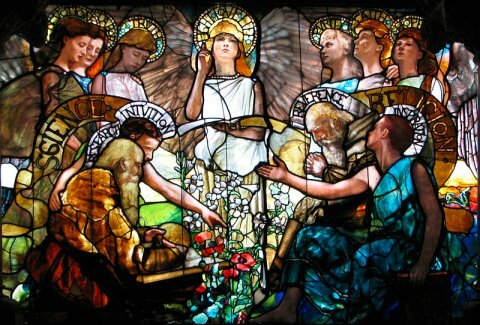 This is the center panel from a stain-glassed window entitled, ‘Education.’ Found in Yale University’s Linsly-Chittenden Hall, it shows religion and science working together to educate people. Like much of what Dr. Dawkins writes, however, the actual evidence says something completely different. Consider, for example, a new study that has been published in the journal American Sociological Review. The authors, Dr. Timothy O’Brien and Dr. Shiri Noy, examined people’s views on religion and science, correlating them with their actual knowledge of science. They found lots of interesting things, but I want to focus on just two of them. First, they found that they could categorize the 2,901 people they examined into three broad groups: traditional, modern, and post-secular. The traditional group, which was composed of 43% of the people studied, preferred religion over science. The modern group (36% of those studied) preferred science over religion. The post-secular group (composed of the remaining 21%) viewed both science and religion favorably. This, in and of itself, is interesting. Many people (like Dr. Dawkins) imagine (quite incorrectly) that there is a “war” between science and religion. It seems that the majority of people in the U.S. agree with this view. As a result, they think they are forced to choose one over the other. However, a minority (21%) have the more reasonable view – that science and religion are both excellent endeavors, and together, they give us a broad understanding of the world around us. The second thing this research uncovered is much more interesting. It found that basic views on the Big Bang and evolution did not trend as someone like Dr. Dawkins would predict. For example, given the three groups of people listed above, which do you think would be least likely to believe in evolution and the Big Bang? The traditionalists, right? After all, the traditionalists prefer religion over science. Thus, they should be the most likely to reject “scientific” explanations for origins. Actually, the post-secular people were the least likely to believe in both! While 21% of the people in the traditional group agreed that “the universe began with a huge explosion,” only 6% of the post-secular people did! The majority of the modern group (68%) agreed with the statement. Similarly, 88% of the modern group agreed that “human beings developed from earlier species of animals,” while only 33% of the traditional group did. However, a mere 3% of the post-secular group agreed with the statement! Now here’s the really interesting part. The study used some scientific questions in an attempt to measure the scientific literacy of the people in each group. These true/false questions were very basic, such as, “All radioactivity is man-made” (false) and “Electrons are smaller than atoms” (true). Nevertheless, they found that there was no discernible difference between the scientific literacy of the modern group and the post-secular group. For some questions, a slightly larger percentage of the modern group got the correct answer, but for other questions, a slightly higher percentage of the post-secular group got the correct answer. Not surprisingly, the traditional group had the lowest percentage of correct answers. This, of course, flies in the face of what Dr. Dawkins claims. In fact, the people who have the strongest opposition to evolution are not those who are ignorant of science. Instead, they know science just as well as those who strongly support evolution. They have just come to a different conclusion. The findings suggest that simply educating the public is unlikely to drive greater acceptance of these theories [the Big Bang and evolution], O’Brien said. “The difference between the post-secular and the modern group is not a matter of a knowledge deficit,” O’Brien said. The post-secular people “understand genetics and experimental methods and statistics,” he said. This is not surprising to me at all. The people I know who are most educated about science tend to reject evolution. Now, of course, the people I know are not representative of the nation as a whole. Nevertheless, this study shows that there are a lot of others like them. Fascinating. As your typical American, statistics never fail to amuse me. I am intrigued, however, at what it is implicated by the terminology “post-secular”? Admittedly, this is the first I’ve heard of it. Could you give me a definition? Zorcey, the term “post-secular” has only been in use for a few years. It essentially refers to a situation in which a group has been living in a secular society, where religion plays little to no role, and have become disenchanted with it from a moral or “meaning of life” standpoint. As a result, they turn back to religion, but not in a way that completely gives up the secular. In the end, they marry the two in order to give them meaning, morality, and knowledge. Here is the essay that is generally given credit for introducing the term. Thank you so much for making us aware of this information. It is exciting to see that the “post-secular” generation is understanding as scientist of “old” (many father’s of science) that religion and science are harmonious and not exclusive. You know, Lindy, that’s what I thought when I read the study. This “post-secular” group is really just going back to what the great scientists of the past understood – that religion and science work together. I’d be curious to know the demographics (particularly ages) of the different groups. Scott, Table 3 in the study has a lot of demographic information. The average age, for example, was 46 years. Surprisingly, that didn’t vary much among the groups. The traditionalists averaged 47 years old, the moderns 45 years old, and the post-seculars 47 years old. The average income among the groups didn’t vary much, either. Moderns and post-seculars were about the same in income, while the traditionalists had slightly less income. I have always considered science and religion to be complimentary and distinct branches of study. Since humans are both physical and spiritual creature, really the only way to begin to understand this state of being is with both physical and spiritual tools of understanding. Of course, we must place God above all else, which would skew the importance of religion above science, but since God created the universe, understanding it can bring us closer to God.